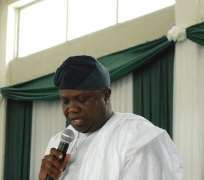 With his campaign posters flooding every part of Lagos ahead of 2015, former Accountant-General of the state, Akin Ambode, has declared his readiness to contest and possibly win the 2015 governorship election in Lagos State on the platform of the All Progressives Congress (APC), Though the aspirant's ambition had been challenged by a controversial declaration by the Oba of Lagos, Rilwan Akiolu, that Ambode the anointed person for the position against Tunji Hamzat, the state commissioner for works and perceived candidate of the State Governor, Mr. Babatunde Fashola, Ambode said he remains one of the strongest contenders for the seat. Oba Akiolu had months ago, at a public event, declared that the state traditional rulers have all endorsed Ambode, a claim many of the traditional rulers later denied. He also accused Hamzat of being a stranger in Lagos saying Hamzat's father was the traditional ruler of Ewekoro in Ogun State. But Ambode, who Akiolu declared was from Epe in Lagos, was later accused of being from Ondo State. While formally opening his campaign office in the Gbagada area of Lagos, with thousands of party members at the event, Ambode commended those who have shown support for his ambition tasking them to continue to promote him peacefully even during the party's primaries. He promised to build a new level of leadership that would eradicate poverty in the State just as he set up a committee to campaign for him at the grassroots level. Some of those who witnessed the event include a House of Representatives member, James Faleke, who promised to deliver his constituency to Ambode, and former Special Adviser to the Governor of Lagos State on Political Matters, Abdullateef Abdulhakeem who also promised to deliver the votes of Muslims in the state to the aspirant. Political watchers believe that Ambode is being supported by leader of the APC and former Governor of Lagos, Asiwaju Bola Tinubu, and is doing all he could to make him emerge the party's flagbearer when campaigns start. On the other hand, Fashola supports his cabinet member, Hamzat, for the position and, according to sources close to him, has vowed to fight for his candidate especially considering the denigrating remarks from Oba Akiolu. Other aspirants in the party including Leke Pitan, Speaker Adeyemi Ikuforiji, Tola Kasali and Leke Pitan are said to hope that one of them would emerge when the Fashola and Tinubu clash over their choice of candidate as the party may thereafter settle for a neutral person.